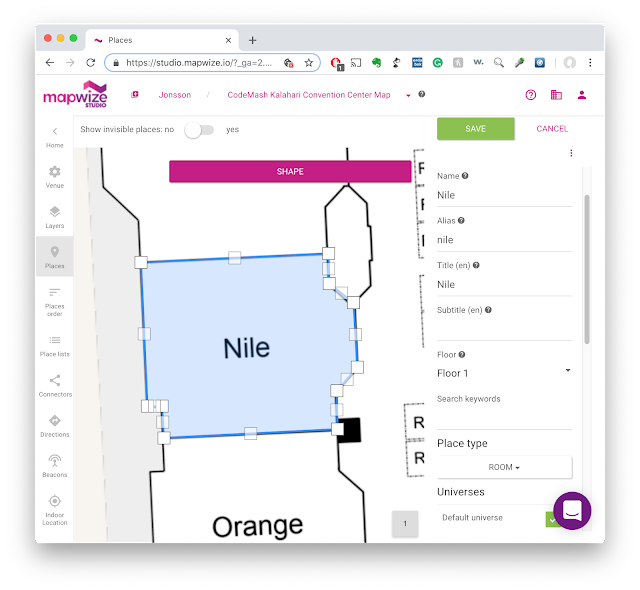 The map allows you to search for a room by name and to get directions between two rooms, in addition to supporting pinch-zoom and general website responsiveness. I emailed the CodeMash team and got a reasonably high res PDF of last year's conference map. I cropped the image and removed much of the background. I imported the image into MapWize Studio and overlayed it onto their street map, which already had the exterior of the Kalahari Convention Center. I then added a new place on the map for each conference room and drew the boundaries of each room. I gave the room a name and configured a few properties, such as room type and marked it as searchable and clickable. This was the most tedious part of the process as it took some time to draw each room onto the map. Next, I drew direction lines along all the hallways and marked the exits/entrances of the building. This is what the software uses when calculating directions between two places on the map. And that is pretty much it. 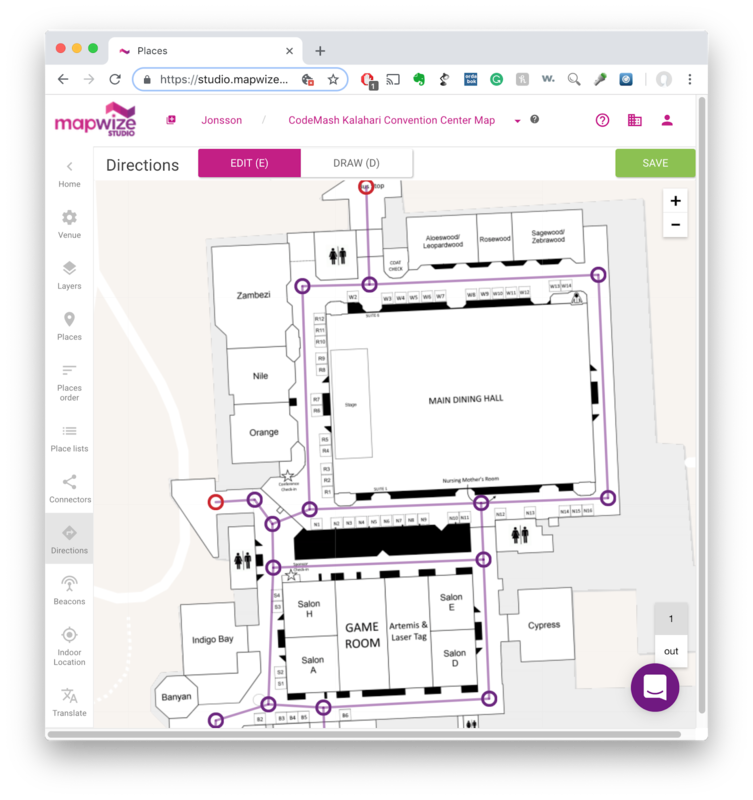 I then published the map and generated a MapWize URL for it. 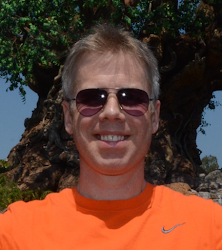 To make it a bit easier to share and to remember, I created the alias codemash.sjonsson.com. 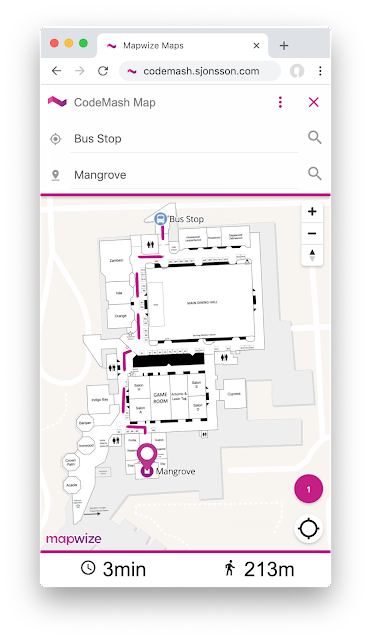 One feature I didn't take advantage of was indoor navigation based on beacons or location of Wifi routers. If those are enabled, the software can show your indoor location on the map. That way you only have to type in the destination when getting directions to your next session and you'll see yourself on the map as you are walking. Pretty much how you'd expect outdoor navigation to work. You can achieve the same by giving the map permission to see your GPS location, but GPS reception is spotty when indoors. Below are my slides from the talk. I spent the past couple of days at the CodeMash developer conference in Sandusky, Ohio. I learned some new technologies, caught up with old friends, and as usual had a great time. Some of the technology trends spotted this year: AI, machine learning, blockchain, digital voice assistants, people getting serious about security, and cheap (often cloud-connected) hardware controllers with tons of neat sensors. Here is some of what I saw at the conference. Unusually warm temperatures at the Kalahari resort. It got into the 60s (F) on Thursday, but then turned into a blizzard Friday afternoon! That's Ohio weather for you. CodeMash definitely peaked my interest in exploring some technologies I haven't used before. Let's get to work on that! I believe this was my 9th time attending this unique event. 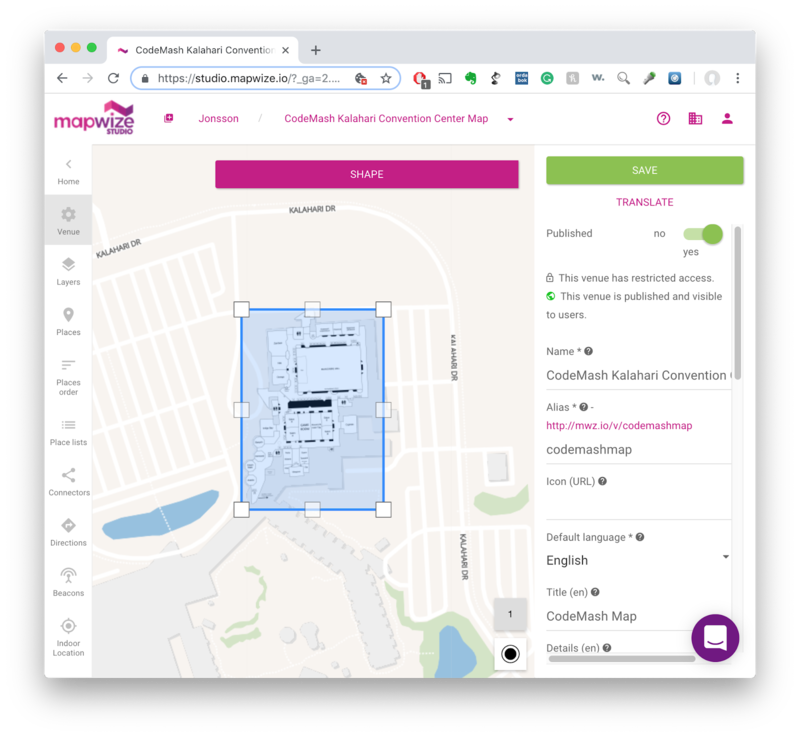 I can't wait for CodeMash 2019. I will be taking my Web Services Testing talk to the QA or the Highway conference next month. I am excited to speak at this QA focused conference for the first time. I have heard a lot of good things about the conference. Alliance Data, my new employer will be sending their entire testing team to the conference, so hopefully I'll have some friendly faces in the audience during my session :) To promote the event and generate buzz, the Testing Curator is interviewing some of the speakers in what they call the Speaker Series. I was recently interviewed. Below is a link to the results. Another awesome CodeMash is coming to an end, with a lot of great sessions and a bunch of fun activities throughout the conference. I attended the full 4 days and was joined by my family for the last 2. For the first time my kids attended KidzMash, where they had a great time learning game development, how robots work, building an Altoid-flashlight and learning how to count to F! In the CodeMash spirit I attended mostly sessions outside my immediate comfort zone; including pre-compiler on 7 languages, front-end talks, UX-talks, softskill-talks and a few pertaining to what I am currently working on; microservices and modularity. 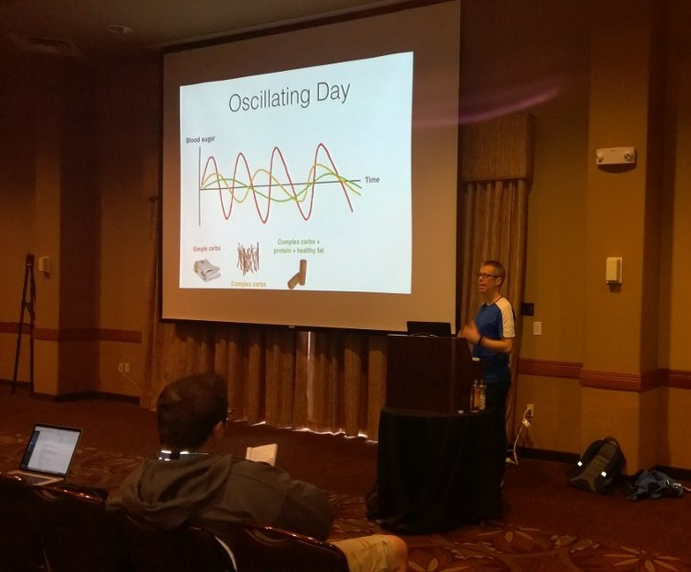 I was honored to be presenting at CodeMash for the third time. This time on a non-technical subject dear to my heart. My talk was titled Program some health into your life; where I walked developers through what it takes to stay healthy at a desk job, the basics of nutrition and exercising, and offered various tips on loosing weight and getting the most out of your effort. It went very well and I was not even booed when I suggested bacon was not the cornerstone of a healthy meal plan! :) Apparently there was a free candy buffet going on at the same time I gave my talk, so I was pleased to see a room full of programmers giving up sweets for health advice :) Below are the slides from my talk. As in years past, hats off to the CodeMash organizers for putting on a great conference. I am already looking forward to CodeMash 2017! Now off to the water park with the family!